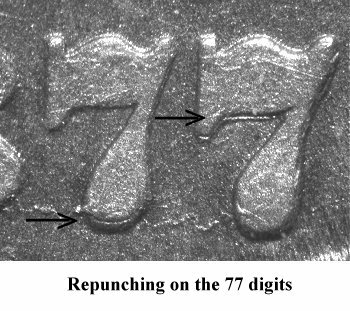 Comments: The 77 digits are repunched multiple times though this variety was previously listed as a repunched date. Obverse 7 is in a later die state with considerable erosion of the denticles. There is a die crack from Liberty's foot through the tops of AMER(ICA). 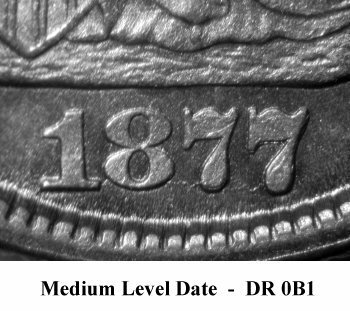 Another from STATE(S) to head, cap and (O)F. A die crack is present from the rim to the left base of 1 digit then across the bottom of the date digits. 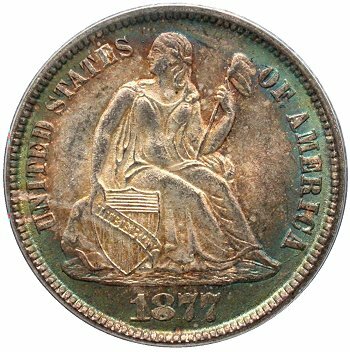 Owning a very high grade PCGS MS66 example (purchased at the Heritage Feburary 2012 Long Beach sale) allowed for an understanding of the magnitude of 77 digit repunching. 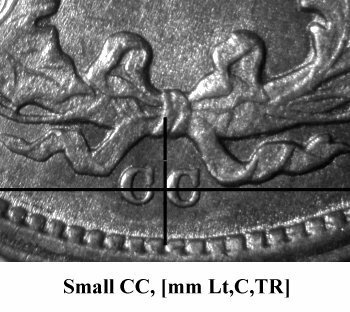 A high power stereo microscope was used to obtain the above detailed macro image and document the different repunching "heights" moving from the field, at the base of the dime's surface, then upward to the top of the digit's surface. 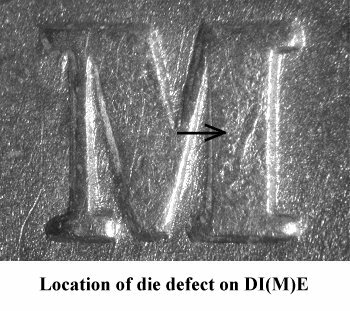 Conversely for the working die, the analysis would start at the immediately top of the die and proceed into the date punch cavity in Height reverse order. Under the microscope four different date repunching were visible at different heights. 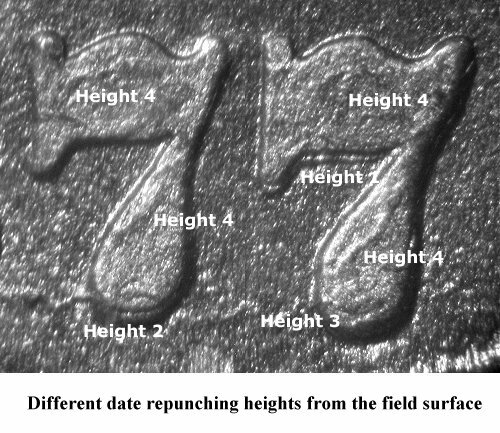 In the macro image, I have labeled those heights as Height 1 (near the field surface), Height 2 (above Height 1), Height 3, (above Height 2) and Height 4 which is date repunching artifacts on the surface of the 77 digits. 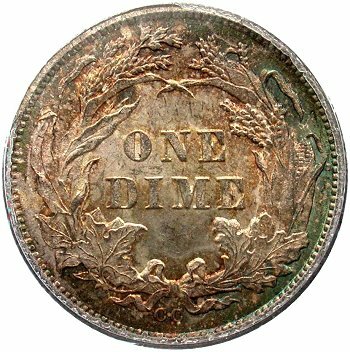 On Reverse H, the M in DIME has a defect on the right upright.